North Carolina Real Estate Commission mandates that all new agents take a series of (3) 30 hour courses after the initial prelicensing course in order to remove the provisional status from your license. All three courses must be completed within the first 3 years of licensure. At least 1 course must be completed per year to maintain your license on active status. Broker Postlicense Courses: The 90-hour Postlicensing Education Program consists of three 30-hour courses prescribed by the Commission which may be taken in any sequence. However, the Commission recommends that you follow the course number sequence (301, 302, & 303), as course materials were developed with that sequence in mind. The primary objective of each Postlicense course is to provide instruction at a level beyond that provided in a Prelicense course on topics deemed to be of special importance to licensees. A provisional broker must satisfactorily complete at least one of the 30-hour courses during each of the first three years following the date of his or her initial licensure in order to retain eligibility to actively engage in real estate brokerage. When a provisional broker has timely completed all three courses, the provisional status of the broker’s license will be terminated by the Commission. Post 301-Brokerage Relationships and Responsibilities: Topics addressed in this course include a review of agency relationships in real estate sales transactions and a real estate agent’s legal duties to clients and customers, a step-by-step review and discussion of the functions and responsibilities of a real estate agent when working with residential sellers and buyers, a review of issues associated with transactions in progress when an agent leaves a firm, and a review of license status and education issues. Post 302-Contracts and Closing: Topics addressed in this course include selected basic contract law concepts, real estate sales contract preparation, sales contract procedures, buyer’s due diligence, closing procedures, Real Estate Settlement Procedures Act, closing disclosures preparation, contracts for deed, options, and real estate license status and education issues. Post 303-Selected Topics: Topics addressed in this course include commercial real estate brokerage, residential property management, land use controls, loan fraud, brokerage compensation issues, license law issues and case studies, selected fair housing issues and case studies, establishing a brokerage firm, manufactured and modular homes and issues relating to short sales. Broker Postlicense Courses Requirement: Possession of a current North Carolina broker license on “provisional” status is a prerequisite for enrollment in Postlicense courses. Prospective Postlicense course students must present evidence of meeting this prerequisite at the time of enrollment. “Provisional” Brokers must complete, within three years following initial licensure “a postlicensing education program consisting of ninety (90) hours of classroom instruction in subjects determined by the Commission” [G.S.93A-4(a)1]. The program consists of three 30-hour courses, at least one of which must be completed in each of the first three years following initial licensure in order to retain eligibility to actively engage in real estate brokerage [Commission Rule 58A.1902]. East Carolina School of Real Estate shall not knowingly enroll an individual in a Postlicense course while the individual is taking another Postlicense course at the same school or a different school if such enrollment would result in the individual being in class for more than 21 classroom hours in any given seven-day period. Tuition must be paid as follows: At time of course registration. Textbook* IS NOT included in Broker Postlicense Course Tuition. *Textbook price is $49.00. Broker Postlicense Courses Fee: $175.00 per 30-hour course. Required NC Real Estate Manual is not included in Broker Postlicense Course Tuition. The Manual can be purchased from the NCREC website or the School. NOTE: Each student is required to use the current edition of the NC Real Estate Manual in each Postlicense course. The printed version of the textbook may be purchased directly from the School. The printed, online, or CD-ROM version may be purchased from the North Carolina Real Estate Commission (www.ncrec.gov). East Carolina School of Real Estate DOES allow students to use the online versions of the NC Real Estate Manual during classes. 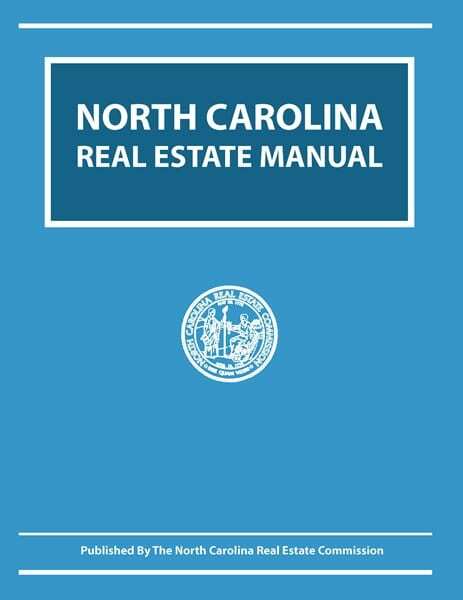 Each student must bring his/her copy of the NC Real Estate Manual to every Postlicense class session. Withdrawals and Transfers / Refunds: A student may withdraw from the Broker Postlicense course by giving written notice to the School at least 72 hours prior to the start of the course and will receive a complete refund. If cancellation is within 72 hours prior to the start of the first class, we will be happy to transfer the tuition fee to another course offered by our School within the next year, however, no refund of any portion of the paid tuition will be given. A student who terminates enrollment in a Postlicense course after the course begins either by written notice to the School or by no longer attending the course will be allowed to carry forward the tuition fee to re-take the course for a period of one year from the original start date of the terminated course. pass the final exam with minimum score of 75%. Postlicense course students must attend a minimum of 90% of all scheduled classroom hours. At East Carolina School of Real Estate, a student may retake a Postlicense course for $100.00, subject to the following conditions: Students who do not pass the Course Exam and the Retake Exam can repeat our Broker Postlicensing Course one time at the reduced tuition during the next 12 months. A Postlicense course student who does not take the final exam on the last scheduled day of a course may take it as a makeup one time within 90 days of the last scheduled day of the course at a time and date stated by the School. A Postlicense course student who takes but does not pass the final exam on the last scheduled day of a course may retake the final exam one time; however, the retake must be within 90 days of the last scheduled day of the course at a time and date stated by the School. 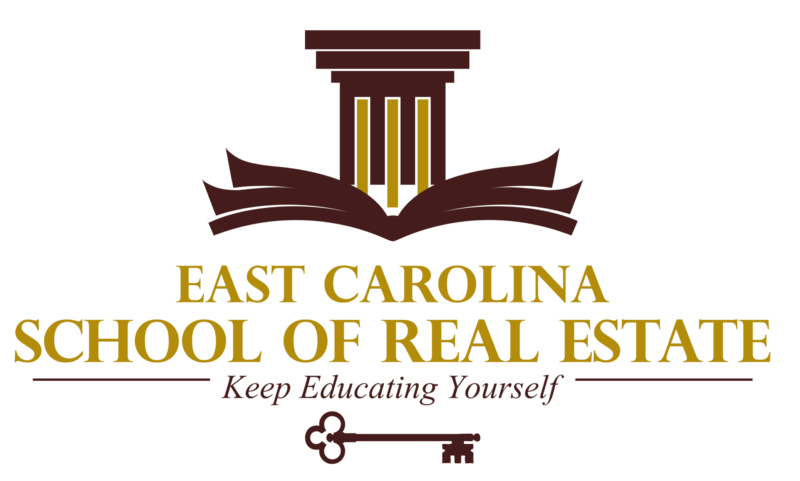 At East Carolina School of Real Estate, a student may retake a Postlicense course for $100.00, subject to the following conditions: Students who do not pass the Course Exam and the Retake Exam can repeat our Broker Postlicense Course one time at the reduced tuition during the next 12 months. Students may use electronic devices to enhance their learning, including taking notes, researching class topics, or viewing the on-line or CD-ROM version of the NC Real Estate Manual. Sending personal emails/texts, shopping online, visiting social networking sites, or playing games are considered to be disruptions and are not acceptable student conduct. If an instructor discovers that a student is using an electronic device for these (or similar) purposes the student will be asked to turn off the device during the remainder of the class. If the wireless Internet access is disrupted during a Postlicensing course, East Carolina School of Real Estate will provide a printed copy of the NC Real Estate Manual to any student who had been using the online subscription. The loaned NC Real Estate Manual must be returned at the end of the class. A student who fails to return a loaned NC Real Estate Manual textbook will be required to pay for it before they can receive their certificate of completion.